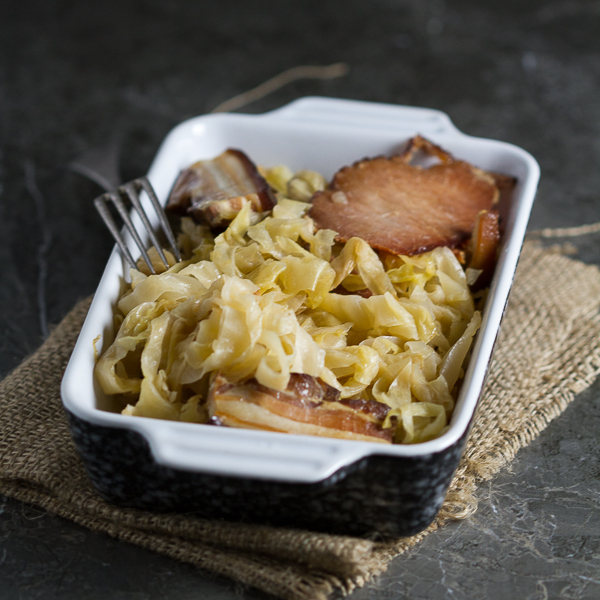 Today’s baked sauerkraut is for all our foodies who are specific in their tastes and jump in without much fuss, only to find themselves enamored with a new delicacy they just discovered. Does this describe you? Recently, while browsing a food forum, I discovered a woman who was wondering the same thing as me. 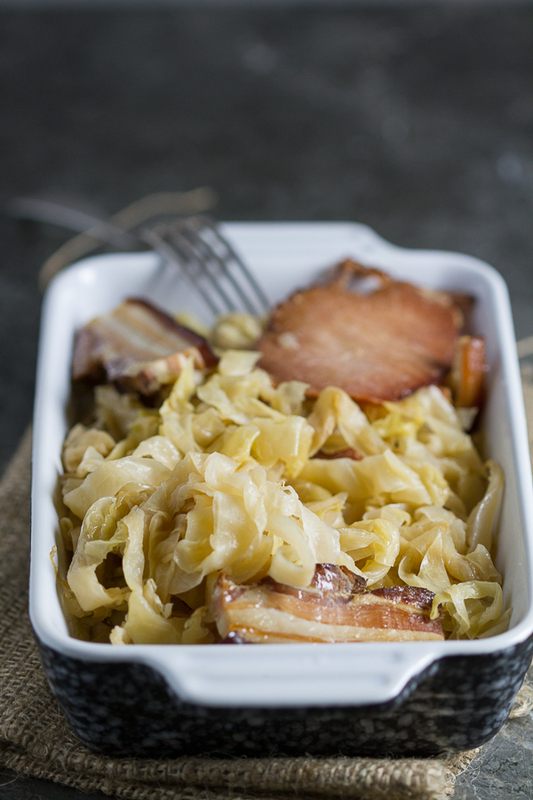 What should one do with fermented cabbage heads left over from the past winter’s fermented batch? Although mine was by no means large, there was still cabbage I needed to use up before the spring arrived. One recommendation was to slice the cabbage and freeze for later. A great option. (Like me, she knows Sarajevo weather is fickle and before long there will be a day full of rain, when only comfort food will do.) But I liked the second option better. Baked sauerkraut. That famous, and not much attempted delicacy. 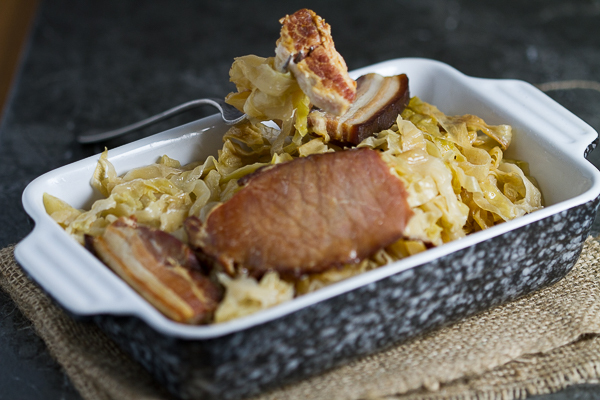 Baked sauerkraut is an integral part of Balkan side dishes. Come winter, there won’t be a holiday that doesn’t showcase a version of it on the dining tables across the region. While the meat is chosen based on religious preferences, this recipe today is a classic one. 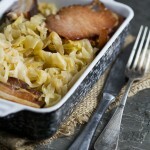 The cabbage is shredded and then baked on the fat of the meat that surrounds it. Let your appetite be the guide to what extent you want to bake it. I prefer it barely underdone, but you can keep it in for a little bit longer for a crunchier, darker version. A word of warning. This is a dish aimed at foodies who like sour and hearty things. It’s by no means a light dish. For example, you wouldn’t eat it and then go for a jog. Taste is not in question here. 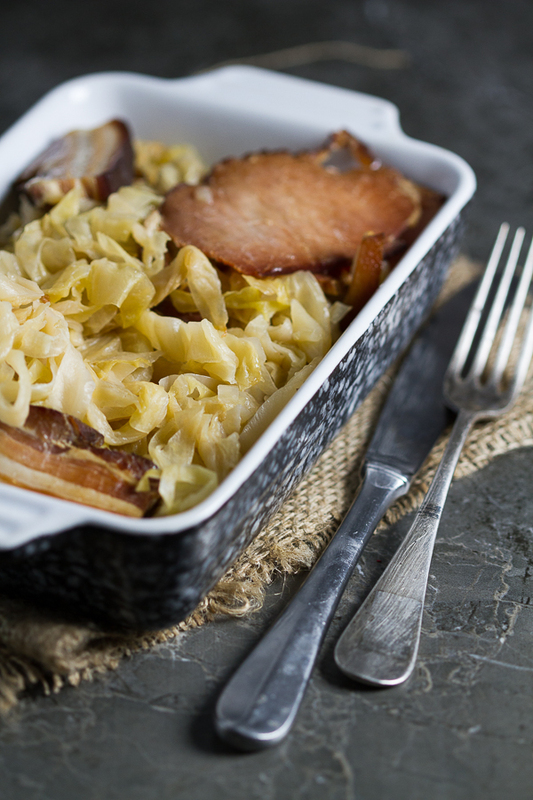 Baked sauerkraut has overtones of slight sourness, and as it’s baked with different meats (I like to mix it with bacon and smoked beef), it inevitably picks up these aromas and presents them together. When combined, these flavors amount to an explosion of taste. The flavors that give it its specificity also make it a strong dish. It’s heavy. And filling. So filling in fact, that you should make your main meal a lighter one. Something fluffy like mashed potatoes. Or rice. And now on to some housekeeping! I am excited to welcome my sister Aleksandra (Sasha) to the BLB team. Sasha has been a BLB fan from (before) day one. 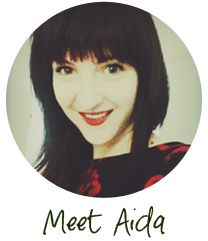 She’s been advising on recipes, helping with ideas and following the blog’s trajectory behind the scenes since its inception in 2014. Now that the site is no longer in its infancy stage, its needs have overgrown the attention I’m able to give it alone. You may remember I’ve had some help before, and the experience was positive. It’s comforting to have another person jump in and take over some of the work. It’s especially comforting when that person arrives with as much enthusiasm and motivation as Sasha. The structure of the blog will stay the same. I’ll continue to write and photograph. Sasha will be in charge of marketing and some translating. We’ll develop recipes, test them and cook food together. Our biggest collaboration will involve making food videos. It’s evident that the recipes plus food photographs, as lovely as they are, are simply not enough. You want more. Well, we heard you loud and clear! As of this month, BLB has produced several Tasty inspired videos, all of which can be checked out on our FB and YouTube pages. We aim to give you new recipes weekly, while video recipes will generally focus on one of the older recipes on the site like the one for bread. It was a tough realization that the blog could be improved with videos. I finally came to a place where I was comfortable with the direction the blog was going, and suddenly there was this new thing that needed to be done. It took me a long time to feel accomplished as a food photographer. I still have ways to go, but I’m happy at the overall, gradual improvement. It took effort and sweat. So did the rest of the blog. I do it because I enjoy it. However, it takes time to produce quality work. To keep the story short, it was a tough but honest realization that the blog could be made even more user friendly with videos. And that I couldn’t do it all alone. Thus, lovely Sasha. With more sweat we are moving into this new filming medium. Admittedly, we’re still tiptoeing. However, with Sasha’s (gentle?) nudging, we slowly made it to the other side. And your feedback has been fantastic! As soon as we put up the first video for Russian salad, we’ve received an outpouring of support. This in turn motivates us to film more. BLB started as a side project, to showcase a prettier side of the Balkans to an international audience. Since the start, not only has BLB found its niche with the US audience, but also with a large number of Balkan followers as well. Videos amplified this even more. We’re glad you like them, we’re glad you like BLB and we’re glad you keep on coming back for more. We hope to eventually film all of the recipes on the site, but we’re taking it step by step. Meanwhile, if you want certain recipes to be put on the soon to-do video list, let us know. We’d like to take the opportunity to thank all of you for being here. It’s because of you that we do this. Leave comments, let us know what you think and what you want more of. And of course, we’d love to know what you’re cooking these days. Taste the cabbage to see whether it’s overly salty. If it is, wash it for a few minutes. When ready, slice into strips. Heat oven to 480°F. Cut the meat into larger chunks and layer in a slightly oiled baking pan. 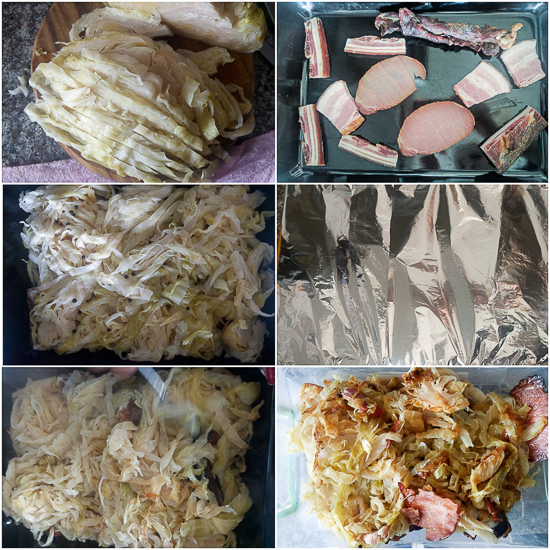 Cover meat with cabbage strips. Sprinkle generously with peppercorn. Cover pan with foil and prick a few holes with a toothpick. Transfer into oven and bake 5 minutes, and then lower to 390°F.